3 bed 2 bath villa with private pool set in 2 acres Fantastic country/mountain views, peaceful but very near to the town of Novelda, near Alicante. Full British Sky TV with Sky Plus and free WIFI. Our lovely ground floor apartment is set in a beautiful complex with communal gardens, swimming pool, children’s play area, tennis court, ornamental lake with waterfall and fountains. Sleeps up to 5. Lovely private villa, with secluded garden and pool. Free Wi-Fi Our guests keep coming back! This magnificent 3 bedroom detached villa is situated in a peaceful position, with a private pool and fantastic panoramic views.Within 10 minutes of beach. 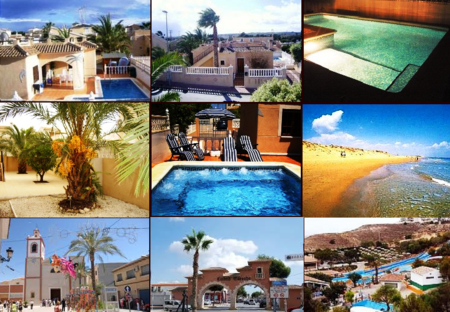 The Costa Blanca is renowned for its turquoise waters, miles of white sandy beaches, fiery fiestas and sizzling nightlife. Visitors adore the ease of its home comforts and family-friendly amenities. Beautiful, executive, front line, 3 Bed Villa, with private pool (optional electric heating available-). Superb views over the golf course. Air Conditioning and heating available. Wifi. Spacious ground floor apartment on the Real Club de Golf Campoamor with 2 bedrooms both with en suite bathrooms. Large terrace with wonderful outlook with private garden and access to shared pool.